August is a big vacation month here. The Atlantic Ocean has warmed up making it a more desirable month for beach lovers. I love it June, July or August, and really, September is the absolute best. The summer people are gone, and usually the weather is terrific, and the sky its bluest..
For my mini metamorph I introduce you to BARry....a portable BAR for your potent potables..
For a small crowd...just open one side..
And here is Barry closed up, and tucked back into the corner..
Would you like a drink??? Please stop in at Susan's for some real metamorps.. WHEW..I NEED a drink after trying for 4 times to get thru that damn dating service thingy. Amazing that this can happen to your personal blog. It is almost like a virus of sorts. Sure hope you can get it fixed. NOW..that little portable bar is awesome. I love that!! Perfect for entertaining your family and friends. 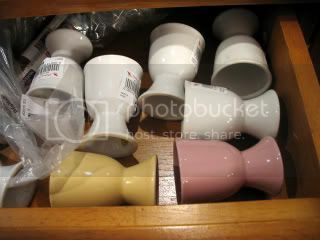 I love that drawer full of egg cups, you cute thing!! Have fun with your new Barby!! This is my main blog. 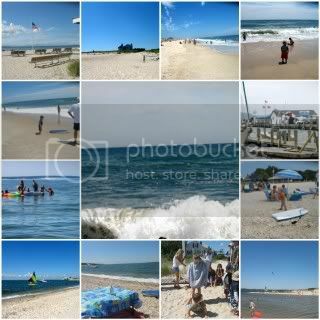 A beautiful collage of beach scenes. I love the big waves and the blue skies. We have the Pacific Ocean, and sometimes its misty! Enjoy! Beautiful beach scenes!Love spending time at the beach! I like your beach mosaic. It's very pretty. Wish I was on the beach now. The blues in your beach mosaic are so Beautifully BLUE! I know that doesn't make sense but Wow, the colors just don't seem real. I don't think I have met Barry before - what a neat accessory to have for entertaining. No problems for me getting here. I want a BaRry! I can think of so many uses for him. I've never seen anything like it. Great find! Hope you are having a super summer! That is such a cool bar. I can't say that I have ever dropped in for an egg at someone's house....maybe a crepe? The beach/ocean photos are gorgeous. I can hear the ocean just thinking about it! The bar is quite useful, isn't it? What a great addition to any family room. I'm sure it will get used a lot. Have a great week! Love the little bar just adorable! I like BARy best opened up for a party! I didn't think about adding a grab bar, but will now give it some thought. Thank you for the suggestion! 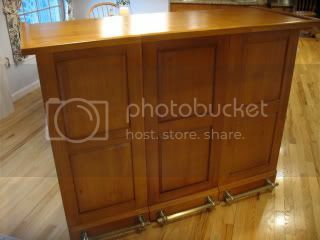 Love the bar/island -so cool ! I love that you can adjust the size ! I really, really, really want a nice bar. 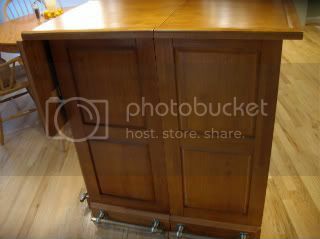 I found a picture of one and suggested to my husband that he could make it and he laughed. Right now our liquor is above the fridge in the cupboard. I think it is up there because I am only five feet tall and can't reach it. Once again he laughed. What nice inviting white sand. I agree September is the best month. Boy, Kathleen, you stash those dishes everywhere :) I love the beach mosaic, such blue skies, where'd you find those with all the rain we're getting, must have been yesterday :) I love your beach pics! So much nicer than Jones! What a smart little bar! Love the mosaic! And Barry is so Very Handsome :-) What an ingenious piece!! I'd be a sucker for that. Have you had it forever? And yet again..I have entered your blog unscathed! Looks like a fun day at the beach! 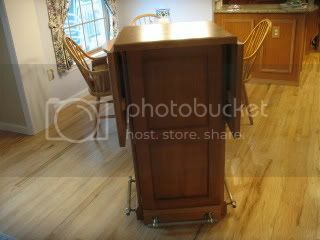 And your "transformer" furniture is awesome! Have a great week! What handy and versitle piece! Perfect for so entertaining. Love how it can expand to accommodate more guests! Love the summer at the beach collage! Thanks for sharing! Have a lovely week! Ah, the BEACH! My friend lives in Rehoboth Beach, Delaware so we get to visit often and I love it there. I love your collage. Such beautiful ocean photos! BEAUTIFUL mosaic ... I never tired of seeing your gorgeous ocean and bay pictures. BARry ... how handy and clever is that. Why am I not surprised that egg cups are stashed in your bar! Barry is fabulous. Ready to dispense drinks . . . and eggs! Pretty and useful too, gotta love it. OK now I am feeling left out -- the dating service clearly is not interested in me! You know I LOVE the beach and water mosaic. We have been trying for several weeks to get out East, I thought we'd get there next weekend but old friends of Howard's called and are on their way from Atlanta to Cape Cod and want to stay overnight with us . . . so that's another weekend we need to stay at home. I think we'll see the East End in September at this rate, and you are right -- the fall IS the best time! LOVE your BARry -- and I'm coming to your house if you use EGG CUPS as shot glasses! Hey there - love the Bar, that is pretty cool! I could use some time at that beach right about now too, given how lousy our summer has been so far. 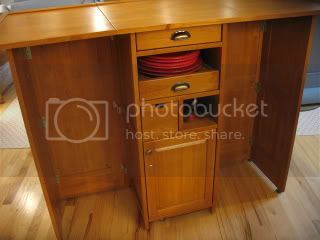 I love portable storage that can be tucked into any room. Great addition! 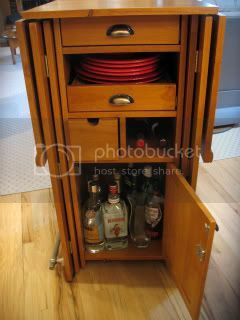 Love the portable bar such a great idea for entertaining, nice amount of storage too! Wonderful beachy collage! My very favorite kind and exactly the theme I chose for today as well! How clever is that portable bar Kathleen? Love your beach and portable bar Kathleen! It is so hot here I need somethin' cool. Wish I was there on your lovely beach sippin' a margarita! Thanks for sharing and coolin' me off! The beach pics are beau - such a pretty blue! Also the BARry is fantastic - that would come in handy during the summer or anytime actually!! 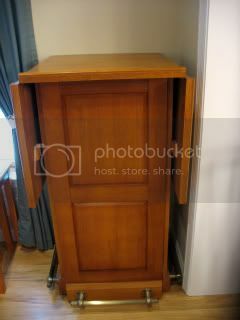 Barry is great for a small space. Love it! 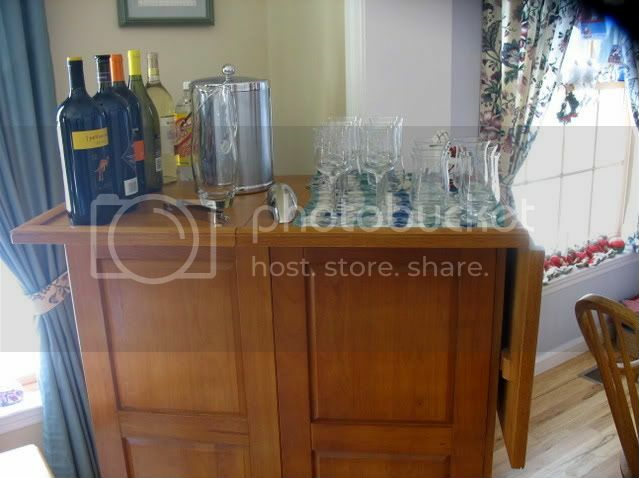 Love the portable bar! Its great!